It seems silly to “review” a book that I’m pretty sure I’m one of the last to have read. Plus, chances are, if you read The Hunger Games, you don’t need much convincing to read the second book in this trilogy. But if you haven’t started this series yet, you may want to skip this post as it contains a few spoilers, and go read The Hunger Games. Right now! We tell everyone at the bookstore who comes in to purchase The Hunger Games, that we’d bet money on them coming right back when they’re done to purchase the 2nd book. After I read HG, I didn’t feel this overwhelming urge to run upstairs, grab Catching Fire and jump right in. I think I loved The Hunger Games so much because it could have been a powerful book all on its own, without the need for a sequel. Sure, I was interested to find out what happened after the games were over, but there definitely was not this huge cliff hanger at the end of HG like there is in Catching Fire. Catching Fire, while it moves a bit slowly in the first half of the book, definitely picks up pace and intensity in the second half. Just when I didn’t think the Capitol could get more evil, I was proven wrong. I was horrified by some of the awful things that happened to some of my favourite characters - Gale, Cinna - but found myself in awe of how well Collins described some of the gruesome wounds, especially Gales. The pain and torture, both physical and emotional, inflicted throughout this book was palpable. 2) Several times, Katniss and her mom make reference to how they are running short on medical supplies and medicine. Is Katniss not allowed to purchase said supplies with the mass quantities of money she receives each month from the Capitol? 3) Near the end of the games, when Johanna has instructed Katniss to “stay down”, Enobaria and Brutus run over to Katniss, declare she is as “good as dead” just by looking at her and move on. Don’t all the tributes know that the sound of the cannon goes off as soon as someone is dead? These tributes are victors - they should definitely know this! But I digress. This was still an amazing book in what I already know is going to be an amazing trilogy. There’s a part of me that wants to hold off reading the 3rd instalment, Mockingjay, just so it doesn’t end and I don’t have to say good-bye to Katniss, Gale and Peeta. 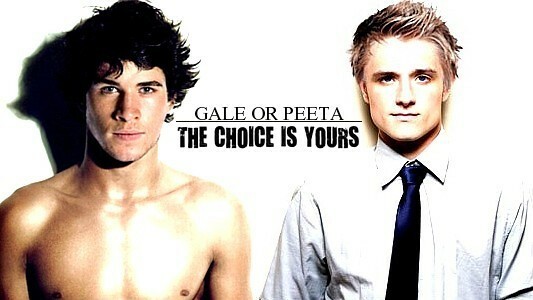 Plus, seriously, I NEED to find out who Katniss chooses: Gale or Peeta? (Team Gale!) And I need to know that Cinna is okay. There - I’ve just convinced myself to go finish the last few pages of my current book and start Mockingjay! Tell me: are you Team Peeta, or Team Gale? I won’t judge.